Astronomers using ESO’s Very Large Telescope have for the first time directly observed granulation patterns on the surface of a star outside the Solar System — the ageing red giant π1 Gruis. This remarkable new image from the PIONIER instrument reveals the convective cells that make up the surface of this huge star, which has 700 times the diameter of the Sun. Each cell covers more than a quarter of the star’s diameter and measures about 120 million kilometres across. These new results are being published this week in the journal Nature. 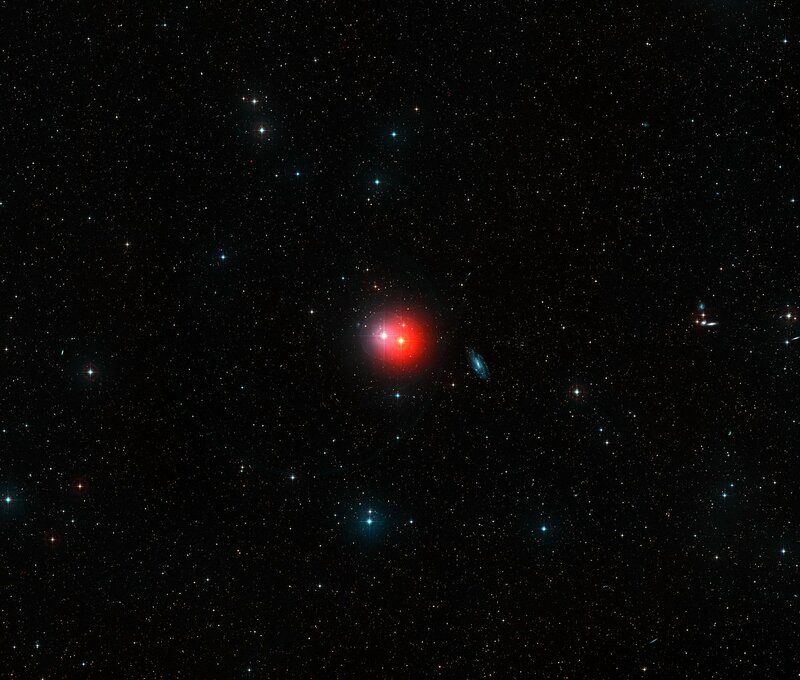 Located 530 light-years from Earth in the constellation of Grus (The Crane), π1 Gruis is a cool red giant. It has about the same mass as our Sun, but is 700 times larger and several thousand times as bright . Our Sun will swell to become a similar red giant star in about five billion years. 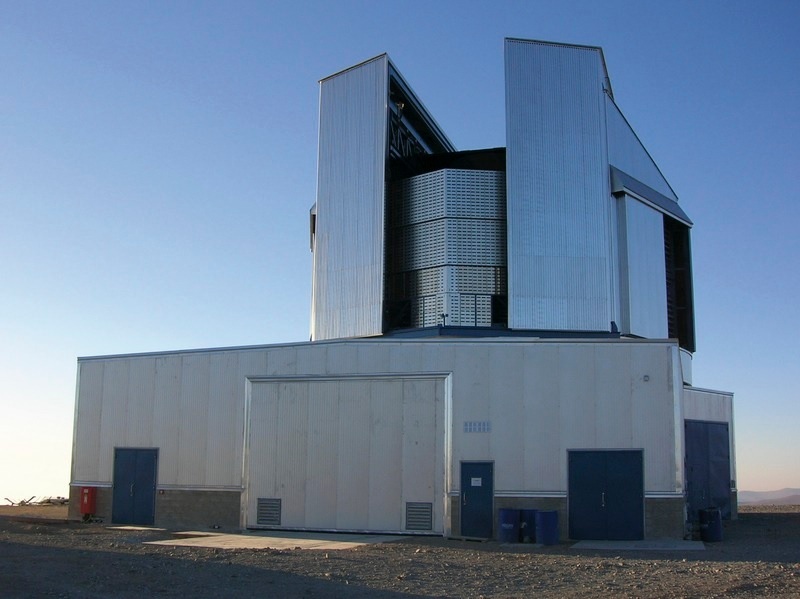 An international team of astronomers led by Claudia Paladini (ESO) used the PIONIER instrument on ESO’s Very Large Telescope to observe π1 Gruis in greater detail than ever before. They found that the surface of this red giant has just a few convective cells, or granules, that are each about 120 million kilometres across — about a quarter of the star’s diameter . Just one of these granules would extend from the Sun to beyond Venus. The surfaces — known as photospheres — of many giant stars are obscured by dust, which hinders observations. However, in the case of π1 Gruis, although dust is present far from the star, it does not have a significant effect on the new infrared observations . When π1 Gruis ran out of hydrogen to burn long ago, this ancient star ceased the first stage of its nuclear fusion programme. It shrank as it ran out of energy, causing it to heat up to over 100 million degrees. These extreme temperatures fueled the star’s next phase as it began to fuse helium into heavier atoms such as carbon and oxygen. This intensely hot core then expelled the star’s outer layers, causing it to balloon to hundreds of times larger than its original size. The star we see today is a variable red giant. Until now, the surface of one of these stars has never before been imaged in detail. By comparison, the Sun’s photosphere contains about two million convective cells, with typical diameters of just 1500 kilometres. The vast size differences in the convective cells of these two stars can be explained in part by their varying surface gravities. π1 Gruis is just 1.5 times the mass of the Sun but much larger, resulting in a much lower surface gravity and just a few, extremely large, granules. While stars more massive than eight solar masses end their lives in dramatic supernovae explosions, less massive stars like this one gradually expel their outer layers, resulting in beautiful planetary nebulae. Previous studies of π1 Gruis found a shell of material 0.9 light-years away from the central star, thought to have been ejected around 20 000 years ago. This relatively short period in a star’s life lasts just a few tens of thousands of years – compared to the overall lifetime of several billion – and these observations reveal a new method for probing this fleeting red giant phase. π1 Gruis is named following the Bayer designation system. In 1603 the German astronomer Johann Bayer classified 1564 stars, naming them by a Greek letter followed by the name of their parent constellation. Generally, stars were assigned Greek letters in rough order of how bright they appeared from Earth, with the brightest designated Alpha (α). The brightest star of the Grus constellation is therefore Alpha Gruis. π1 Gruis is one of an attractive pair of stars of contrasting colours that appear close together in the sky, the other one naturally being named π2 Gruis. They are bright enough to be well seen in a pair of binoculars. Thomas Brisbane realised in the 1830s that π1 Gruis was itself also a much closer binary star system. Annie Jump Cannon, credited with the creation of the Harvard Classification Scheme, was the first to report the unusual spectrum of π1 Gruis in 1895. Granules are patterns of convection currents in the plasma of a star. As plasma heats up at the centre of the star it expands and rises to the surface, then cools at the outer edges, becoming darker and more dense, and descends back to the centre. This process continues for billions of years and plays a major role in many astrophysical processes including energy transport, pulsation, stellar wind and dust clouds on brown dwarfs. π1 Gruis is one of the brightest members of the rare S class of stars that was first defined by the American astronomer Paul W. Merrill to group together stars with similarly unusual spectra. π1 Gruis, R Andromedae and R Cygni became prototypes of this type. Their unusual spectra is now known to be the result of the “s-process” or “slow neutron capture process” — responsible for the creation of half the elements heavier than iron. The team is composed of C. Paladini (Institut d’Astronomie et d’Astrophysique, Université libre de Bruxelles, Brussels, Belgium; ESO, Santiago, Chile), F. Baron (Georgia State University, Atlanta, Georgia, USA), A. Jorissen (Institut d’Astronomie et d’Astrophysique, Université libre de Bruxelles, Brussels, Belgium), J.-B. Le Bouquin (Université Grenoble Alpes, CNRS, IPAG, Grenoble, France), B. Freytag (Uppsala University, Uppsala, Sweden), S. Van Eck (Institut d’Astronomie et d’Astrophysique, Université libre de Bruxelles, Brussels, Belgium), M. Wittkowski (ESO, Garching, Germany), J. Hron (University of Vienna, Vienna, Austria), A. Chiavassa (Laboratoire Lagrange, Université de Nice Sophia-Antipolis, CNRS, Observatoire de la Côte d’Azur, Nice, France), J.-P. Berger (Université Grenoble Alpes, CNRS, IPAG, Grenoble, France), C. Siopis (Institut d’Astronomie et d’Astrophysique, Université libre de Bruxelles, Brussels, Belgium), A. Mayer (University of Vienna, Vienna, Austria), G. Sadowski (Institut d’Astronomie et d’Astrophysique, Université libre de Bruxelles, Brussels, Belgium), K. Kravchenko (Institut d’Astronomie et d’Astrophysique, Université libre de Bruxelles, Brussels, Belgium), S. Shetye (Institut d’Astronomie et d’Astrophysique, Université libre de Bruxelles, Brussels, Belgium), F. Kerschbaum (University of Vienna, Vienna, Austria), J. Kluska (University of Exeter, Exeter, UK) and S. Ramstedt (Uppsala University, Uppsala, Sweden).